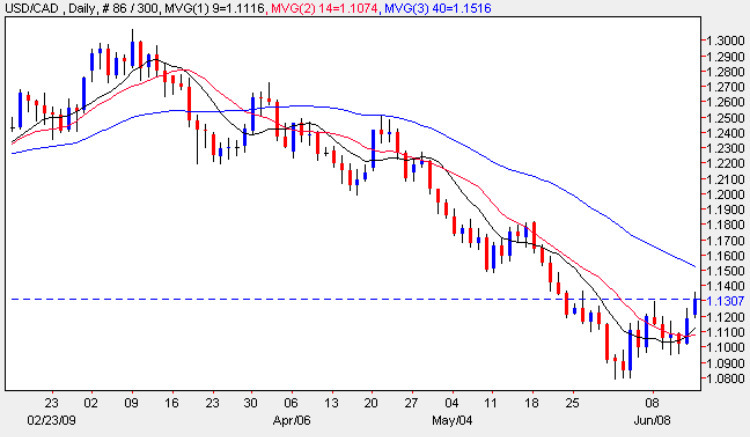 Friday’s wide spread up bar brought a week of sideways consolidation neatly to an end with the usd to cad virtually closing at the same price as at the open of Monday morning, and finishing the day above both the 9 and 14 day moving averages. As outlined several times before in previous market commentaries for this pair it is no surprise to see a period of sideways consolidation and perhaps even a short term reversal following such a long and sustained bearish move, and with the 9 and 14 day moving averages now crossing we may see an attempt to rally higher this week, which should provide further opportunities to enter the market to the short side. As always the usd to cad is inextricably linked to commodity prices (in particular crude oil) and its relationship to its nearest neighbour and the US Dollar, and indeed this morning has seen a modicum of Dollar strength return as evidenced in the daily Dollar Index chart. Whether this Dollar strength remains in place for the medium term remains uncertain and we need to be particular aware of the current geo-politics (Iran, North Korea etc) as well as correlations between crude oil and equity markets. Items of fundamental news on the economic calendar for today for the US are mainly dominated by various speeches from FOMC members and Treasury Geithner – details of which are covered on the main euro dollar site. The site also covers the TIC data and Empire State Manufacturing Numbers. For Canada we have the Bank of Canada’s review of the financial system and manufacturing sales and new car sales data, the first of which came in better than expected at -0.1% versus a forecast of -1.5% whilst the latter came in at 0% against a forecast of 0.1%.